For motorheads and professional mechanics alike, putting together a high-quality set of tools is among the highest priorities. Unfortunately, there are almost endless options available, for every possible type of job. Once your tools are accumulated in your garage or in the shop, it’s now time to find something to store all of them in. That’s where the tool chest comes in. Unfortunately, there are almost as many tool chest on the market as there are tools. Every type of tool had their own dedicated chest. Where would you possibly start? Well, once again, this buying guide should help you do just that. All the legwork and research has been taken care of, with several models looked at in order to pick out the best all-around tool chest for a variety of needs. Like always, though, the picks are based on versatility, rather than bells and whistles or any other superficial criteria. That was a bit harder than usual, though, since there are many different categories of chests. So, there are going to be varying sizes, numbers of shelves, and differences like that, but regardless, every single chest on this list is able to check off as many boxes as possible, as far as individual requirements are concerned. As can be seen from that brief sample size, none of these chests are going to be exactly the same. While the differences aren’t going to be game changers in most instances, they still do change the scope and overall appeal of each tool chest, so they do bear mentioning. So, for those who are in the market for that perfect new storage device for your prized tool collection, but don’t really have an opinion on brand or type, then come on in, and let’s take a closer look at some of the best available options, and see just what they do that makes them so special. Well here’s a colorful way to start things off. This tool chest by Viper manages to accomplish a lot more than to make a visual statement. Let’s start with the exterior, though. That vibrant lime-green paint job is powder-coated to stand up to any amount of abuse that you’ll put it through, and given its nature, it will likely see a lot of it. Look inside though, and you’ll see a wealth of storage drawers, each one offering plenty of room. A solid tool chest for a great price. This is a tool chest, so it was meant to hold as many of your tools as possible. Nonetheless, it has a total of over 2400 cubic inches well distributed among the main compartment on top and the three front-facing shelves. Not only does this give you tons of room, but it’s broken up in such a way that it helps keep you organized, with everything you need exactly where you need it to be. Right from the beginning, Viper built this chest to last. Starting with the 18 gauge steel shell, they built it from the ground up for strength. To finish things off, they powder coated everything just for that extra finishing touch. The resulting product is one that is bound to last you for many years to come. The price tag that comes with this tool chest is a bit steep when you first look at it, but then, once you take some time to consider what it’s meant to do, it will become clear that the price tag is more than reasonable. It’s strong enough to take a beating, keeping all of your tools safe and secure, and the value is present the entire time. DeWalt is a company that is best known for putting together well-made, high-end tools that outperform even the highest expectations. Because of that, you’d think that their attempts at a tool chest would have the same attributes. You’d be right, and although it’s not as big as many others on this list, it’s more than roomy enough to confidently hold your most important tools, and it’s going to do it to a level that the competition just can’t match. Plus, if you need more room, this chest is part of a complete storage system that easily stacks together, so DeWalt has you covered. It’s kind of tough to make a tool chest very versatile because really, it’s essentially just a large box. What could possibly be done change its nature? Well, how about adding removable cup that are lidded, so you can store all the small bits and screws that you may need, and take wherever you need to go. This tool chest by itself is decently roomy and can hold several of your most used smaller tools. However, if that just won’t quite cut it, DeWalt wisely built a whole system that allows you to mix and match to get exactly trh storage that you need. This tool chest was built as a finishing police to a full storage system, and for such a low price point, more than lives up to the expectations it’s been given. While not huge and overly spacious by itself, it’s still very sturdy and durable, with a very affordable price point. It isn’t meant to break the bank, rather it’s a great entry point to a very good tools storage system. When you think of a rolling tool chest, chances are that an image very similar to the aesthetic of this tool chest is what comes to mind. It’s got a classic design, with a solid steel outer shell that will all but certainly protect all of your valuable tools.Overall, it’s a nice heavy unit that just feels well-made, and has a lot of attention to detail that places in a category all of its own. Ideal for mechanics everywhere, it’s perfect for just about any home garage. This is a pretty large tool chest, so naturally it’s going to have a lot of storage space for almost anything you need to store in it. What’s more though, is that the manufacturer included several drawers, all with sufficient room themselves, so you can keep all your tools stores in a very organized, efficient manner. You’ll rarely have to look for something twice, and that by itself is a pretty necessary feature. This is a very well-built, spacious tool chest that does its job very well. Normally, that would be enough for most companies, and consumers would likely be satisfied. That. however, isn’t good enough for Husky, and they outfitted the top with a solid wood top that works perfectly as an extra workspace. THis way, you don’t need to be stationary to get your work done. Anywhere you need to be, this chest is there with you. Solid all steel construction is going to cost a fair amount of money, and this chest is no exception. While the price may initially scare buyers away, just take a look at all of the little finer touches that went into building it. All the drawers are fully lined, it has a solid wood top for added workspace, and boasts several other feature that you’re not likely to find in any but the most high end offerings. Structural foam isn’t something that you would normally think of when looking for a sturdy outer shell. It won’t be as strong as steel, obviously, but makes for a superior alternative to plastics with a less dense, more lightweight composition, but every bit as much strength and impact resistance. It also has a unique, textured finish that lends visual appeal to the final product. Not only is well made and durable, the structural foam is cheap and easy to produce, meaning less cost to the consumer, which is always a good thing. 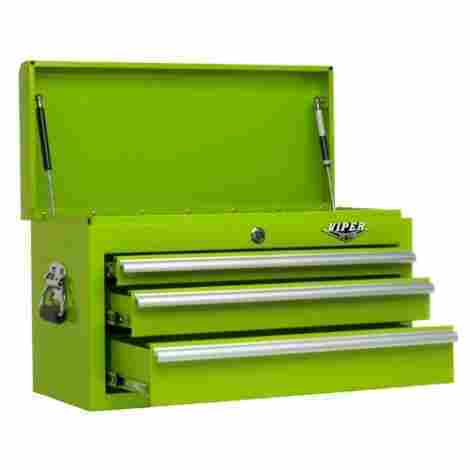 This tool chest differs from a lot of the other selections on this list due to the fact that instead of various compartments, it has one big cavity to store all of your tools. THis may make things a bit less organized, but on the plus side, it allows you to store larger, more cumbersome tools that would likely otherwise get in the way. Let’s talk about the foam shell for a minute. In order to give the consumer as much value for their money as possible, DeWalt decided against using steel for the shell. That’s fine, but will plastic cut it? Not according to them, so they went with an injection molded foam that has all of the strength and durability, but is much less dense, more lightweight, and best of all, cheaper. Instead of traditional metal or plastic, this chest is made from an injection molded foam that is lighter and cheaper, giving you plenty of strength and performance, at a much lower cost to the manufacture,and, by extension, a lower price for the consumer than comparable chests. All this gives it the most sought after feature that is sadly hard to come by: value. This is yet another classic looking tool chest that has a lot of visual appeal. This may seem like an unnecessary thing to point out, but that all depends on who’s using it. Chances are, if you’ve gone to the trouble of assembling the perfect workspace, complete with all of the right tools, then you need everything to look the part. You take a lot of pride in your work, and this tool chest illustrates that perfectly. It looks good, it’s well-built, and it has great value. What more can I say? This is a must-have for handymen everywhere. This particular Kennedy safe boasts six fully lined drawers, making it the ideal go to product for storing all of your beloved precision hand tools. Anything that you store in it is going to be well protects, making sure that your tools will last as long as you do, if not longer. While the name doesn’t carry quite as much recognition as some other more well known brands, in the world of high end tool chest, Kennedy branded products go hand-in-hand with quality and reliability. When a brand name becomes so synonymous with well made products, that in itself is a coveted feature. This chest comes with everything you could think of, including a fairly steep price point. Although to be fair, it is a large, all metal storage chest designed to take abuse, and keep on going. Sometimes it can be difficult to determine value in a product, but when it comes to this chest, it is blatantly obvious. Despite being smack in the middle of this list, tis sharp blue tool chest from Excel ranks right up there among my favorites. Classic design clean look, and everything else that a high-end tool chest needs to truly be considered as one of the best are all prominently featured in every inch of this baby right here. It doesn’t have much in the way of cosmetic additions, and looks about as plain as they come. This minimalist look has a lot of appeal, and more than makes up for any shortcomings with top notch performance. Given the very reasonable price point, the value of this chest is easy to underestimate. Excel wanted to make a chest that can go toe-to-toe with the big boys, and it shows in every aspect from the construction to all the added perks, but not in the price. Built for a king, but meant for the working man, you can’t go wrong with this chest. The handles found on each of the drawers are high grade aluminum, and run the entire length of the drawer itself, which provides effortless access to the contents no matter what angle you come at it from. This is important, because when you’re in the middle of a job, you rarely have time to stop nad mess around with hard to open drawers. I’m noticing a bit of a trend as I put together this buying guide. All of the solid metal, traditional looking tool chests are right at the top as far as cost is concerned. This chest has broken wirth tradition, and provides everything that any of the other high-end offerings do, yet all for a fraction of the price. The only thing that Excel sacrificed when they made this chest is the high price. Of all of the rolling tool chests that I’ve included so far, this one is probably one of the biggest, though it doesn’t really look the part. It’s deceptively large, I’ll give it that, and can hold a very generous amount of tools, parts, and other equipment. All this makes it a perfect chest for mechanics and maintenance men, since it allows you to have virtually everything you need right at your fingertips. If you want to take things a step further, the price point that When slapped on it puts it much lower than most of the competition. 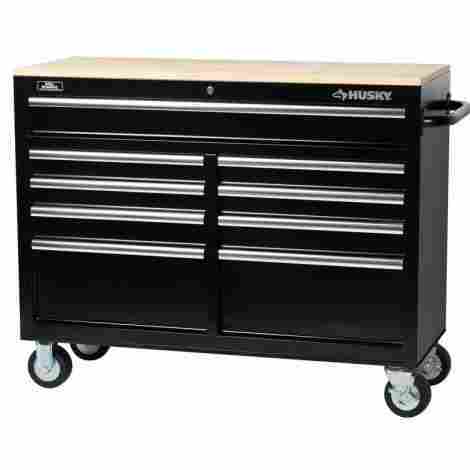 The nature of this type of tools chest makes it ideal for mechanics, with its large storage capacity and strong exterior, but unlike other similar models, this one will fit in just as well in any situation you put it in. For anybody putting together their first workspace and needing a dependable tool chest, look no further. Not only is this tool chest designed to hold a lot of stuff, but each of the drawers can hold up to 100 pounds without a problem, so right there you know that it’s meant to be a heavy duty unit that can hold anything you need it to and won’t buckle under the pressure. In terms of tool chest in general, this one ranks near the top. Put it up against similar competition, however, and things start to balance out pretty quickly. This is likely going to be not only one of the most affordable rolling tool chests that you’ll find on best of lists, but it’s also going to be among the cheapest in general. As much time I spent singing the praises of the last Excel tool chest on this list, I was a little concerned that it would be a one hit wonder. Fortunately, that wasn’t the case at all, and here they are again, just a couple spots later. This one, though, is about as unique a selection as you’re likely to find here. Built much smaller and more compact, it’s innovative cantilever design makes it surprisingly versatile, opening up to reveal more than ample storage for your needs. Keep in mind that this one is built for smaller tools, and as such, its portability is second to none. How can I say anything about this particular tools kit without mentioning the insane amount of storage space that it provides? That’s the very nature of its design. When looking at it closed, it looks like a normal tool chest that can hold a nice amount of stuff. Open it up though, and wow. The tiered drawers peel away to reveal all the room you could want for all of your smaller hand tools. 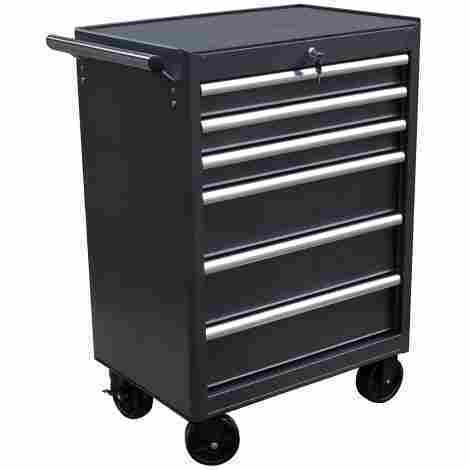 There are several examples of tool chests on this list that come with a powder coated exterior, but in this case it has a greater impact on the overall performance of the unit. The other ones are all larger and quite heavy, making them less portable and essentially stationary. This is much smaller, and is made to go everywhere with you. This increase convenience, but it also raises the risk of exposure to extra wear and tear. That being said, anything you can do to make it stronger is more than welcome. 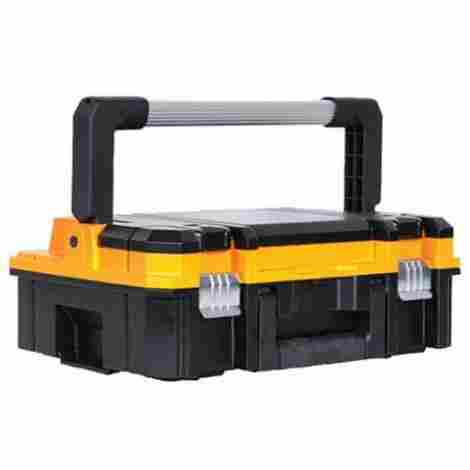 This very portable, compact toolbox is the perfect accessory for the handyman who is always on the go, not content to remain stationary for any amount of time. In normal circumstances, this can present the problem of not letting you carry enough stuff, but this model opens up to hold it all, and won’t cost more than a few dollars. Excellent value, and unparalleled convenience. An at home mechanics dream, this is an excellent example of an automotive tool chest, and should be on anyone’s list to at least take a look at. The polypropylene construction is lightweight and strong, holding up just find to the rigors of your home garage. 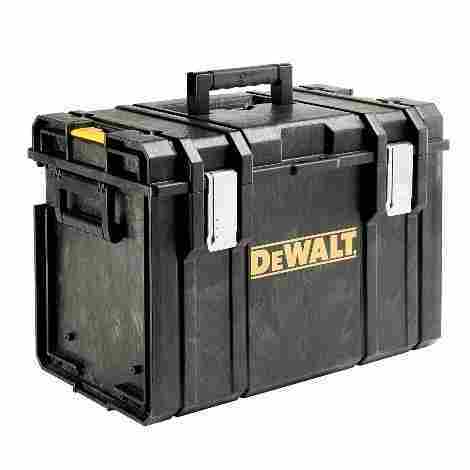 This is a high value, low cost tool chest of superior construction, and as such is solid investment that you could feel good about, without ever having to worry about breaking the bank. On the vast majority of tools chests that contain drawers, you’ll find that they are all about the same depth, which can make it a bit difficult to properly organize things. This one, however, takes care of that, simply by making the bottom drawer quite a bit deeper, giving you a whole new set of options for your storage needs. One of the most useful aspects of this tool chest has got to be its ability to break down very easily in to a flat, compact, easy to store piece that can then be tucked away until you need it. This is perfect when redoing your shop, moving house, or just need to transport the chest to a new location. Thanks to the use of a polypropylene polymer, the manufacturers could afford to pass a whole lot of savings on to you, the consumer. Normally, this would mean sacrificing quality and durability in the name of saving a few dollars, but luckily this chest is able to hold up just fine. Arguably, this tool chest is the best of the best, though it is also by far the most expensive. This is a totally complete tool chest that should be able to serve your needs for as long as you need tool storage. Featuring plenty of drawers in a variety of lengths and depths, this is the kind of tool kit that serious mechanics put on their wish list. Each of the drawers have a maximum capacity of 185 pounds, so what you can store in here is pretty much limited to your imagination. The main drawers of this tool chest all have a hefty maximum weight limit of 185 pounds, which is more than enough to accommodate the heaviest and most cumbersome tools. Not only does this increase capacity, but it also allows the drawers to stand up to more abuse without breaking down. International decided to cover their tool chest with added protective materials. On the corners, at least. The corner edges are covered with an aluminum strip, protecting what would otherwise be a more sensitive area that is prone to more impacts and wear and tear. It is very difficult to ascertain value when looking at this particular chest. The reason being, the price point is just so high that justifying it can be quite the challenge. That being said, this chest does have a lot to offer, and will begin to prove its worth after only a few uses. If budget isn’t much of a concern, than by all means give this one a look. As stated above, for whatever reason, there are just so many tool chests to choose from. Maybe it was intentional, all in the name of choice. Or maybe, which is more likely, the market was absolutely flooded with cheap knockoffs from upstart companies just looking to rake in profits. This is always a possibility in a market which is typically controlled by the whims of a few specific brands, setting a price point that can be seen by many consumers as unreasonable. Along with the poor quality models, however, comes the introduction of new innovations, form well-meaning, reliable companies that truly want to make a difference in that market. This helps keep things from getting stale, always keeping the bigger brands on their toes, and giving the consumer a much more complete world of choices to better meet all of their needs. With that being said, the goal of this list was to pick out all of those gems and expose them to the world in all of their glory. So if all goes well, now that it’s been made clear what’s out there, the average user should be better equipped to be able to make as informed a decision as possible. There are several various types of tool chests for a variety of different purposes, and these are going to help determine which one will become the go-to choice. On top of that, tool chests can be part of a larger storage system that combines in different ways to accommodate every conceivable need. Depending on the required purpose, tool chests are going to range from small, easy to carry models to spacious cabinets that are built to hold large tools and parts. In order to meet the requirements of professional mechanics, a tool chest needs to have a large amount of total storage capacity, measured in the form of cubic inches. Tool chests and cabinets can go from a few hundred cubic inches, all the way up to hundreds of thousands. On top of this, the ideal chest will spread this space out with a large main compartment on top, and one or more drawers of differing lengths and depths. Also, these drawers need to have a decent maximum weight limit, which will then increase the options for the user when deciding what to store and where. Some newer chests are also beginning to feature removable cups or containers that are designed to fit several smaller bits, screws, and various other parts, adding increased storage and organization to the chest. 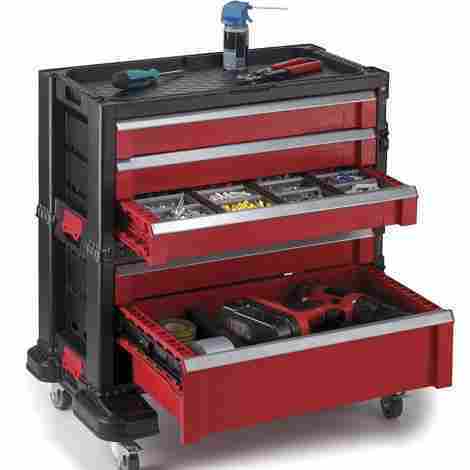 For more casual, or at home mechanics who like to tinker more than anything else, a larger, more expensive tool chest with more space may not be the ideal choice. A capacity of tens of thousands of cubic inches, multiple drawers, and additional storage options may become a hindrance when the chest isn’t used to store that many tools. To this end, a dedicated chest with a single compartment protected by a flip-up lid may be much more suitable to the user. Alternatively, if a single chest isn’t quite sufficient, an intermediate chest can be added as a supplemental piece. 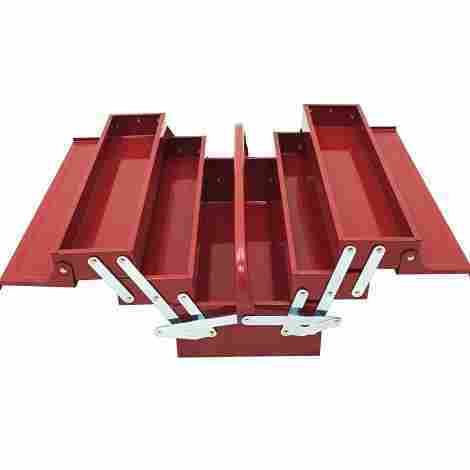 These are used in a storage system to provide increased storage through the use of one or more drawers without taking up any more real estate in a workshop. Some mechanics don’t have a shop or other stationary place to perform their work, and instead prefer to be mobile, going to the job rather than having the customer go to them. In these cases, the mechanic has a few choices to meet their needs. For one, they can opt for a smaller tool chest that can be transported by way of handles. This is a viable option for smaller jobs where not a lot of tools are needed. One of the biggest drawbacks to using a smaller, more portable tool box or chest is the fairly strict limits to how much can be carried. While there are several sizes available to accommodate differing amounts of tools, in the end, everything really comes down to how much weight the user is comfortable with carrying. Tools can be heavy, and that weight can add up pretty quickly. Unfortunately, a larger cabinet on casters isn’t much help in this case. As they tend to be larger and heavier, but are very portable or sturdy when being transported. Luckily, the second option is an almost perfect blend of both the portable tool chest and the larger capacity of the cabinet. These are known as auto-carts, and are specifically designed to be used in a vehicle. They have a portable base that is ideal for storing and transporting them and are known as portable truck-boxes. They have much more capacity than a tool chest but are also meant to be portable. When choosing the perfect tool chest for a garage or shop, it is very important or not overestimate how much storage is going to be needed, as well as the amount of abuse it is likely to be exposed to. Otherwise, a tool chest that is much too large, with unnecessary features is purchased, and this can be incredibly costly. Tool chests can range in price from a few dollars to several thousand. 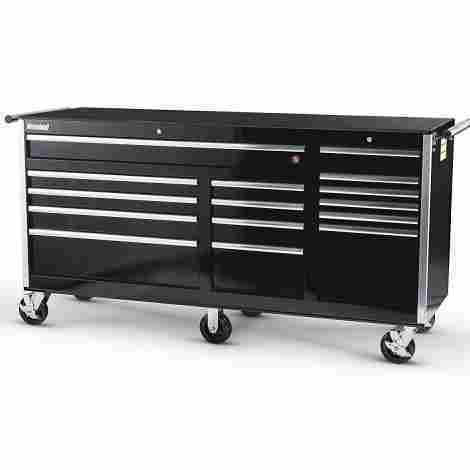 Keep in mind, the high-end tool chest that cost thousands are specifically meant for very intensive work in a busy, professional setting where multiple vehicles are being worked on simultaneously. They are made of very heavy gauge metals, have a significant capacity, and often double as a work surface as well. They are also very heavy, and are usually part of a full storage system that includes a wheeled cabinet, a top chest, and sometimes an intermediate tool chest that adds more storage space. Smaller tool chests, ideal for the everyman, are generally going to be exposed to less use, and by extension, less abuse. Because of this, they can be made from lighter plastics and other polymers, which are easy to produce, and more importantly, much cheaper. These options tend to be more portable, due to being smaller and lighter, and are designed for the home garage. Also, they will often cost only a few dollars, only rarely crossing into the hundreds of dollars range. As the individual needs of the user increase, these tool chest can be added to, but keep in mind that this will cause the price to go up. Function is only an important criteria to determine how much tool chest is required. What this means is that if the chest is only needed to store a handful of tools, then a single compartment is often going to be enough. From here, though, The stand-alone chest can also have drawers for greater storage and organization. Beyond this, the chest can be placed on top of a cabinet, making it part of a much larger mobile tool center. If even more storage and organization is needed, an intermediate chest can be used and sits between the top chest and the cabinet. Aside from having different methods to storing as many tools as necessary, tool chests can serve other functions such as having a workspace or bench located on the top of the unit. This is accomplished by finishing the top with a surface made from a more durable material, such as wood, or a rubberized polymer. Just for the fact that the tool chest can be customized to provide a variety of storage solutions based on need as well as available space, tool chests are becoming increasingly functional and versatile. One thing to be aware of though, is that the more high functioning chests with the greatest variety of options are also most often going to be among the most expensive. Unless the chest is also needed to hold a large number of tools, these high priced models aren’t a great choice, since they are usually very large. Auto-carts: These are carts that are made with a pivoting base and are meant to be used in vehicles. Cabinet: The cabinet is the bottom piece of a tool storage unit, and is usually larger than the other parts. The cabinets have casters affixed to the bottom to give it better portability. Cantilever: A type of tool chest in which the shelves can unfold to give access to multiple tiers at the same time. This type of shelving is very compact when not in use. Casters: These are part of a set of wheels that are attached to the bottom of a tool cabinet and allow the user to easily transport tools from one location to another. Intermediate chest: An additional tool chest that sits in between the top chest and the cabinet. Instead of a top that flips up, these usually have several drawers that add an exceptional amount of storage without requiring the need for purchasing additional stand-alone units that would otherwise take up a significant amount of space. Polypropylene: A polymer that is used to make various products, in this case the primary one being tool chests. It’s a very rugged material that is also resistant to various solvents, bases, and acids. Powder coating: A coating that is applied to surfaces as a dry powder. It is applied and is then cured via heat in order to allow it to flow and cover the entire surface as a type of skin. It’s hard finished is typically used to coat metals and give it increased impact and dent resistance. Top chest: Typically this is the top piece of a tool storage system, one that has a top lid that flip open, and may contain drawers for additional storage. It sits on top of the tool cabinet, and is mainly meant to hold smaller tools such as hand tools. Trolley: This is another name for the tool cabinet, and comes from the fact that they are on wheels, and can contain several tools and parts that can be easily moves from place to place. These are most commonly found in mechanic’s shops, due to the number of projects usually going on at one time, and the need for tools to always be as accessible as possible. Work bench: A work bench is typically a stationary work surface designed for projects, but some tool chests are built with the top doubling as a portable bench. These chests don’t contain a flip up lid, but instead are finished in a suitable material, such as wood or a rubberized platform, to provide extra room for craftsmen and mechanics to perform work without having to find a designated space. Q: What’s the difference between a tool chest and a tool cabinet? Tool chests are often made as part of a more complete storage system that contains several pieces, each one with a different purpose. The tool cabinet is the bottom piece of this set, and is affixed with casters to allow for greater mobility. The tool chest is the top piece of the system, and is designed to sit on top of the cabinet. The chest has a top lid that opens up, and may contain one or more drawers as well. Some sites may also have what is known as an intermediate chest, which fits between the top chest and the cabinet. These are generally smaller, containing 1-4 drawers, and are an efficient way to increase storage without taking up extra room in the shop. Q: Is it easy to keep tool chests organized? Many tool chests available today are made in such a way that all your tools and smaller parts have their own dedicated storage spots. They have several drawers of differing sizes, each meant for a specific type of tool, such as smaller drawers for hand tools, deeper ones for power tools, and so on. Some even come with small removable trays that are perfect for all of the screws and little bubbles that tend to get away. Three are still some smaller chests that don’t have drawers, instead opting for one large cavity to hold everything. These aren’t naturally organized, but with a few dividers, containers, and patience, this can be easily remedied. Q:Do I really need to get a tool chest? It isn’t mandatory, but having a suitable tool chest with an adequate number of drawers and plenty of total capacity will go a long way to keeping even the most cluttered workshops neatly organized. 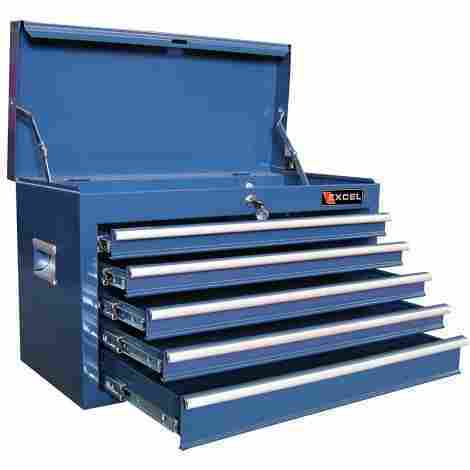 Tool chests are designed for mechanics who have and use a large number of tools, and would benefit greatly from having everything they need close at hand. 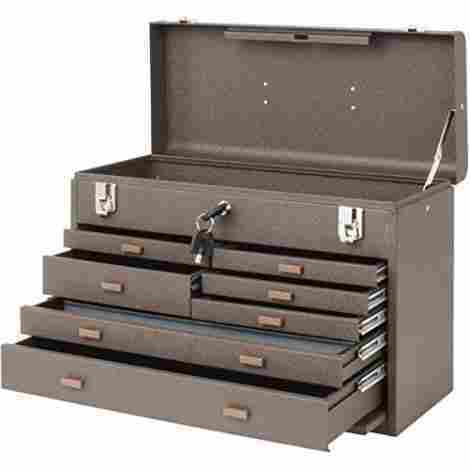 Having a well organized tool chest can help the job be completed in a more efficient manner. Q: Does it matter what material tool chests are made of? The short answer is yes. To get in to it a bit more in depth, it all depends on the environment the chest will be used in. In a mechanics shop, any tool chest that isn’t made from heavy gauge metal is likely not going to last for very long. There are exceptions, of course, and the average at home mechanic should do just fine with a chest made from a lighter polymer, as the risks of it being abused too much are lower. For a professional setting, thought, the best tool chests are going to be made from heavy duty steel, have strong metal hardware, and be finished with a powder coating to give that final level of protection. Gear4wheels.com – Tool Box vs Tool Bag: Which One Is Right For You?